A national movement has hit Crook County. It's called Small Business Saturday, and it's happening this Saturday, Nov. 24 at a multitude of local shops, restaurants and businesses. 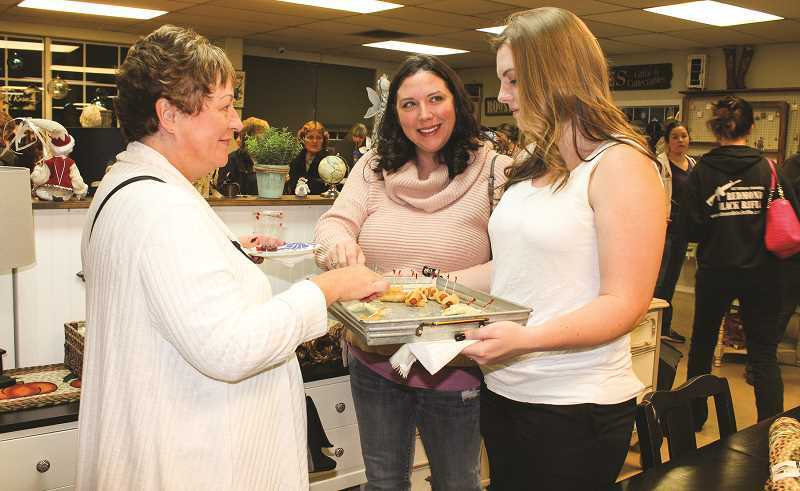 "It's a promotional event that we're doing to try to encourage people to stay in Prineville and shop in Prineville on that day," explained Prineville-Crook County Chamber of Commerce Executive Director Kim Daniels. Sandwiched between the national Black Friday and Cyber Monday shopping days, Small Business Saturday is designed to support the Mom and Pop shops in communities. "Our promotion is in line with the national campaign started by American Express and supported by the Senate," Daniels pointed out. In an effort to support local shops that make communities strong, in 2010, American Express launched Small Business Saturday on the Saturday after Thanksgiving to encourage people to Shop Small and bring more holiday shopping to small businesses. In 2011, the U.S. Senate unanimously passed a resolution in support of the day, and officials in all 50 states participated. It even got a shout-out from the president of the United States. So what does that mean for Crook County shoppers? A chance to win a free shopping spree! Here's how it works. Spend $25 or more with any Prineville-Crook County Chamber of Commerce business member this Saturday during Small Business Saturday. "It's not just retail. If they went to a restaurant, if they were getting pictures done, if they were getting their hair done, whatever, any chamber member," Daniels pointed out. Shoppers must then bring their receipt to the Chamber office during normal business hours by Thursday, Nov. 29 and be entered into a drawing for four preloaded $25 gift cards that the winners can then spend anywhere. Daniels noted that there's a limit of one entry per person, and the receipt must have the Nov. 24 date with a minimum $25 purchase at a Chamber member business. The four winners of the $25 prepaid gift cards will be announced Friday, Nov. 30. While shoppers are checking names off their lists, they can also purchase bracelet charms at any of the 17 businesses participating in the Chamber's Charm Trail program. And, through the end of November, shoppers can get a free charm when they donate a nonperishable food item, which will be donated to the Holiday Partnership. Daniels reminded charm collectors that there's a limit of one free charm per person with one donated food item. Additional charms are $1.50 each. Several Chamber member businesses are already prepared for the holiday shopping season, and some plan to offer Small Business Saturday specials and extended hours. A list of Chamber members can be found on the Chamber's website. "We're just doing this as a favor to our local businesses to get people out shopping," Daniels said. "Try and spend your money locally with the businesses in our community that help generate business and money and jobs and everything else in our community." Visit http://www.prinevillechamber.com/category/members/ for a list of Chamber members. Turn in your receipt at the Chamber office, 185 NE 10th St., by Thursday, Nov. 29. Chamber hours: Weekdays 8:30 a.m.-4:30 p.m.
For more information, call the Chamber, 541-447-6304.